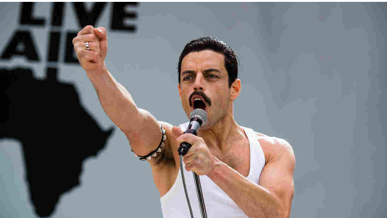 The recent award of an Oscar for best acting performance to Rami Malek for his portrayal of the singer Freddie Mercury in the movie Bohemian Rhapsody highlighted, among other things, the tragic deaths of so many creative talents from the scourge of AIDS. The award was particularly timely because of several highly publicized news stories that have recently come to our attention illustrating how research into the cause of AIDS now reverberates in many other scientific and ethical arenas. Thankfully, owing to much research conducted over the last few decades, AIDS is now usually a treatable disease and so is not an automatic death sentence as it was in Freddie Mercury’s time. In order to understand why these current news stories are of interest we should first review a few important facts about how the causative agent of AIDS, the virus HIV-1, goes about its business. 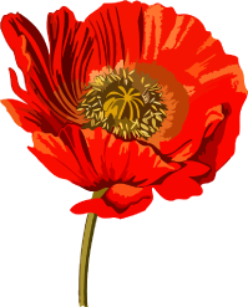 Like all viruses, the life of HIV-1 is that of a biological parasite. The virus needs to infect human cells and use their biochemical resources to allow it to replicate and then infect further cells. Viruses are the simplest life form we know of and many would argue that they aren’t really “alive” in any real sense of the word as they can only exist as parasites by co-opting the resources of animal cells. HIV-1 can only use human cells for its productive replication. HIV-1 basically consists of a shell of protein molecules surrounding some RNA -the genetic material that carries the information allowing host cells to replicate the virus. Once inside a host cell, the viral RNA is copied into DNA which is then spliced into the host’s genome allowing the virus to replicate using the cell’s own transcriptional machinery. But how exactly does HIV-1 gain access to a human cell? To accomplish a protein from the viral capsid called gp120 binds to a specific receptor which allows the virus to attach itself to its target cell before entering and replicating. As the receptor for HIV-1 is only expressed on certain cells, this dictates the selectivity or “tropism” of the virus. The identity of the receptor that allows HIV-1 to infect cells has been intensively investigated. It turns out that the HIV-1 receptor consists of two proteins expressed together on target cells. One of these is a protein called CD4 which is primarily expressed by certain cells of the immune system. The other protein is a receptor for a molecule called a chemokine. These two proteins act in unison to form the HIV-1 receptor. Actually, there is a large family of different chemokine molecules and chemokine receptors. One of the best described actions of chemokines is to direct the migration of immune cells as a central aspect of inflammation. Chemokines also direct the migration of stem cells during organogenesis and haematopoiesis. The particular chemokine receptor of importance for HIV-1 infection is called CCR5 which normally acts as the receptor for chemokines such as the molecule CCL5 (also called RANTES). Some strains of HIV-1 use a different chemokine receptor known as CXCR4 to infect target cells. However, at least during initial HIV-1 infection, CCR5 appears to be the major chemokine receptor used by HIV-1 to infect human cells. Which cells express CD4/CCR5? Many of these are cells of the immune system including macrophages, dendritic cells and some T lymphocytes. These cells can be infected and ultimately destroyed by HIV-1 and this explains why the effects of HIV-1 primarily target the immune system and produce a state of immunodeficiency. Our understanding of the molecular basis of HIV-1 infection also suggests a way of blocking the actions of the virus. If we had a drug or other method of interfering with the ability of HIV-1 to engage its CCR5 receptor then it wouldn’t be able to infect cells. Many experiments using viruses and cells in culture have shown that this line of reasoning really works -but how could this be achieved in an HIV-1 infected patient? Nowadays, research analyzing the molecular genetics of human populations has become a powerful new approach for understanding human diversity and disease. Several years ago it was observed that some people carry a mutation in their CCR5 receptor gene. A naturally occurring 32-base pair deletion in the CCR5 open reading frame (CCR5D32) introduces a premature stop codon and generates a shortened form of the protein that does not appear on the cell surface and so cannot interact with HIV-1. In African and Asian people CCR5D32 is nearly non-existent, while in Caucasians, the frequency of the CCR5D32 allele is 10–20% and the prevalence of individuals who are homozygous for the mutation is 1–2%. As might be predicted the homozygous genotype (CCR5D32/D32) leads to a complete absence of CCR5 from the cell surface and resistance to HIV-1 infection. It has been concluded that the mutation appeared in the human population some thousands of years ago. It isn’t clear why it began to spread but it must have provided some kind of evolutionary advantage. This couldn’t have been resistance to HIV-1 infection because HIV-1 didn’t appear in the human population until the 1980s.So,it has been speculated that it must have provided resistance to some other haematological disease. At any rate, these observations have inspired the development of anti-HIV-1 therapies that interrupt the interaction between the virus and CCR5 as a way of blocking HIV-1 infection. Because individuals with natural CCR5 deficiency are largely resistant to HIV-1 infection, around a decade ago doctors in Germany carried out a daring experiment. They were treating an AIDS patient who was also suffering from acute myeloid leukemia (AML). Patients with AML can be treated by transplantation of haematopoietic stem cells that will hopefully generate new blood cells in the recipient that are free of leukemia. In this instance the doctors decided to transplant stem cells from a donor who also carried the D32 mutation in both copies (alleles) of the CCR5 gene. They reasoned that the patient’s blood would become repopulated with cells that were not only non leukemic but were also resistant to infection by HIV-1. After depletion of the patient’s own immune system, CCR5D32/D32 donor progenitor cells were expanded and differentiated into mature lymphoid and myeloid cells that were resistant to HIV-1 infection and introduced into the patient. Amazingly, HIV-1 in the patient dropped to undetectable levels and, some 10 years later, the patient remains free of detectable HIV-1.In other words he was essentially cured of the disease. This patient has become known as the Berlin Patient. Several other attempts following the success of the Berlin Patient have only proved to be partially successful at best and researchers began to wonder whether this patient was a “one off”, that is a unique example that had succeeded for some unknown reason. However, very recently a new report in the journal Nature has described a very similar case. This patient was also given a D32/D32 stem cell transplant to concurrently treat his Hodgkin’s lymphoma. Here again, some 18 months later, the patient appears to be HIV-1 free meaning that it is very likely that the “London Patient” now joins the “Berlin Patient” as a second example of a successfully cured AIDS patient. For both the Berlin and London patients the stem cells that were transplanted were obtained from other individuals who happened to have cells that were both D32/D32 and immunologically compatible with the recipient subject involved. However, nowadays there are also other possibilities for obtaining CCR5 deficient haematopoietic stem cells. The rise of the science of gene editing means that it is now relatively straightforward to take out a patient’s own stem cells, apply an editing procedure to the cells using CRISPR or another editing protocol, and then reintroduce the edited cells back into the patient. Indeed, efforts to do this are currently underway. But then there is yet another possibility. Why not take human embryos and perform the same kind of gene editing and then let the edited embryo develop into a viable child? Such a child would be free from the possibility of being infected by HIV-1. Although this is a theoretically possible scenario, scientists around the world had agreed informally not to attempt to do this kind of experiment because of uncertainties surrounding the use of CRISPR gene editing, currently by far the easiest method to use. For example, it is possible that when you attempt to use CRISPR in this way some inadvertent “off target editing” might also occur and this could lead to unfortunate unforeseen consequences. It was therefore a great surprise when on November 28th 2018 last year at a gene editing conference in Hong Kong, a Chinese scientist announced that he had actually carried out just this experiment. The name of the scientist was He Jiankui from the Southern University of Science and Technology in China, who announced that he had edited the CCR5 genes of twin girls at the embryonic stage in an effort to protect them against HIV-1 infection. The first-of-its kind outcome was apparently healthy twin girls born without CCR5. He also claimed that he had carried out a similar procedure on a third embryo that was due to be born later this year. Although He’s results haven’t been published yet, and so it is difficult to assess what he actually did, experts in the field consider it highly likely that He was telling the truth. As might be expected, He’s announcement created an enormous furor for numerous reasons. Scientists all over the world criticized his work and many powerful figures in the field have now attempted to impose a moratorium on anybody else doing the same kind of thing, at least until it is generally agreed that it is a safe thing to do. Indeed, the fact is that it is already clear that inactivating the CCR5 gene may have some unanticipated consequences. Is it really the case that all that the CCR5 gene does is to allow people to become infected with HIV-1? This is something that seems rather unlikely. In the case of the Berlin and London patients, the inactivated CCR5 gene will only be expressed in haemopoietic cells derived from the stem cells which they received. Does this have any consequences? At first glance people who are homozygous for the D32 allele appear completely normal. However, because of all of the activity in this field of research, these individuals have been placed under increasing scrutiny. Epidemiological studies have now revealed that lack of CCR5 may in fact change an individual’s response to certain infections in addition to HIV-1. For example, if people with no functional CCR5 genes are infected with West Nile virus, a mosquito born infection, the course of the disease is much more serious in these people than in individuals who have a normal complement of the functional receptor. This effect is not due to increased ease in being infected by the virus but through changes in the mechanism by which the symptoms the virus produces are manifest. In other words, perhaps not surprisingly, the CCR5 receptor does play an important role in the immune responses to certain infections. Hence, the effects of deleting CCR5 from an animal may have consequences beyond the fact that they are resistant to HIV-1 infection. Indeed, other recent data makes this point even more clearly. We have discussed the fact that CCR5 is normally expressed by certain white blood cells and so plays a role in phenomena like immunity and inflammation. But is the CCR5 receptor expressed by any other types of cells and does it have functions beyond its role in the blood? Could CCR5 regulate the functions of a completely different tissue such as the brain for example? The brain consists of several types of cells. Obviously there are nerve cells. In addition, however, there are glial cells, primarily astrocytes and oligodendrocytes, neural stem cells and also microglial cells which represent the macrophages of the brain. Microglial cells, which are related to the white blood cells, express chemokine receptors such as CCR5 which is not surprising given their developmental lineage. Neural stem cells which have to travel long distances in the brain during development also express chemokine receptors which seems reasonable considering the chemotactic roles of these molecules which allow them to help direct the course of stem cell migration. Some years ago it was also demonstrated that neurons and glia can express chemokine receptors suggesting that chemokine signaling had further roles to play in the nervous system in addition to their traditional roles described in the haematopoietic system. One well known phenomenon that is associated with HIV-1 infection is a constellation of negative cognitive issues which affect nearly 50% of HIV-1 infected patients. The most widely believed cause for these problems is that productive HIV-1 infection of brain microglia produces inflammation of the brain. However, the observation that neurons themselves express chemokine receptors also suggests that direct effects of HIV-1 on neuronal cells may be the real cause of these problems. But what are the actual functions of chemokine receptors expressed by neurons? One indication of what such roles might be come from experiments reported a few years ago by scientists working at UCLA. These investigators reported that when they screened 148 different strains of mice for their performance in certain memory tests they observed that mice in which the CCR5 receptor had been deleted (“knocked out”) performed unusually well. This suggested that normally CCR5 had an inhibitory effect on memory function. 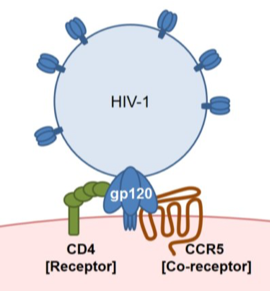 As gp120, the coat protein of HIV-1, normally interacts with CCR5 and can activate it, the investigators also tested the part of the gp120 protein that actually interacts with the CCR5 receptor and found that it inhibited memory function in mice. These data supported the idea that CCR5 expressed by neurons could play a role in memory and that HIV-1 might produce cognitive problems by activating this receptor. However, if this is true then it raises other interesting possibilities beyond the world of HIV-1 infection. After all, there are numerous human diseases that involve severe memory deficits. One of the most serious of these concerns the effects of stroke or traumatic brain injury (TBI). Many people who survive from stroke or TBI have difficulties in making certain movements or have cognitive problems. During the period following the initial injury many patients recover to some extent-a processes that involves new learning and memory. Clearly therefore understanding the factors that can promote learning and memory following stroke might suggest important therapeutic targets for treating patients trying to recover from these problems. Based on their initial findings the UCLA scientists hypothesized that CCR5 signaling in neurons might be an important factor regulating the recovery from brain injury. A very recent paper appears to support these ideas. It is widely thought that the physical correlates of learning and memory involve the structure of synapses in the brain. For example, the dendrites of neurons and synapses formed on these structures known as dendritic spines are thought to be the sites of long term changes in synaptic activity that represent the foundations of memory. A great deal of research has helped to identify the biochemical and structural changes that occur at these sites during changes in behaviors that require learning and memory. Following stroke or TBI many of these structures are lost in important areas of the brain such as the cortex and hippocampus. Some of them are reformed during recovery from brain damage. So, we might ask, what is the role of CCR5 signaling in the regulation of this process? The scientists at UCLA first observed that following stroke or TBI in mice, nerves in the brain greatly increased their expression of CCR5 receptors. Their previous results had indicated that these receptors may have an inhibitory effect on learning and memory-so, perhaps in this context they were inhibiting recovery from brain damage? To test this idea the scientists used a method to reduce the increased expression of CCR5 in neurons following brain damage. Just as predicted these animals showed an enhanced ability to recover from stroke. Not only were they better able to perform behavioral tasks but they also showed more of the dendritic/spine structures that contain synapses. These data suggest that a drug that blocks CCR5 receptors in the nervous system might also enhance recovery from brain damage. Naturally, there have been numerous efforts to produce such drugs because they should also block the ability of HIV-1 to infect cells. In fact a drug called maraviroc, which is currently used to treat HIV-1 infection, works precisely in this way-it blocks CCR5 receptors. The mechanism by which it does this is quite interesting. Rather than acting at the same site on the receptor as HIV-1 or a chemokine, maraviroc binds to a different site and changes the conformation of the receptor so that it is no longer accessible to HIV-1. It is what is called a NAM or negative allosteric modulator. Whatever its mechanism, the result is the same -maraviroc blocks the activation of CCR5. When the investigators gave maraviroc to mice they also observed that they recovered much more completely from brain damage. Not only that but the drug could be administered some 3 weeks after damage had occurred and still showed beneficial effects. This great news because, if you think about it, it is necessary to be able to treat brain damage after it has occurred rather than beforehand (how would we know a priori which individuals are going to suffer from a stroke?). All these experiments supported the idea that blocking CCR5 receptors in the brain might be a totally new therapeutic approach to the treatment of stroke. But, of course, all of the experiments were done using mice. We know that it is relatively easy to cure diseases in mice. Unfortunately, for many reasons, such results rarely hold up when extended to humans. The real question therefore is whether the approach would work in human patients. Here Nature allows us to perform an exceptional experiment. We have discussed the fact that some humans, those with the D32 phenotype, express fewer functional CCR5 receptors. As it happens there is a data base in Israel which had collected information on how individuals recover from brain injury (Tel Aviv Brain Acute Stroke Cohort (TABASCO)) The TABASCO team identified 68 people in its cohort of stroke survivors who had at least one copy of the CCR5 mutation. Compared with people without the mutation, they performed slightly better on tests of motor and sensory skills and cognitive abilities both 6 months and 1 year after a stroke. This is a very encouraging result. Given the fact that CCR5 receptors seem to inhibit long term recovery from stroke one might wonder why the brain increases their expression following brain injury. The answer may be that nerve cells in the damaged area often become overexcited following injury and this could produce further damage. Hence, increased CCR5 expression may the brain’s way of preventing this from happening. Whatever the reason, drugs that block CCR5 function are now the subject of intense interest for post stroke therapy. Having said that, we know that CCR5 receptors are expressed in many tissues beyond white blood cells and the brain and so other effects of giving CCR5 receptor blockers may be anticipated. Nevertheless, the observation that humans with the D32 genotype don’t seem to have abnormal health issues in general, encourages one to believe that the treatment may be relatively safe. It will be clear from the above discussion that the recent interest in CCR5 receptors highlights the many interconnections between different aspects of biology and medicine. In particular, it highlights some of the potential problems associated with gene editing. It is quite rare for a gene only to have a single function in animals. Deleting the CCR5 receptor from embryos will no doubt help the resulting children live an HIV-1 free life. But it would be naïve to think that this will be the only alteration in their biology that will result. In this case we might also observe that they will recover more easily from brain damage -certainly not a bad thing. But in other instances genetic edits could lead to unanticipated changes that are not beneficial. This is very cutting edge medicine and it isn’t clear what we will find when we peer over the precipice. Proceeding cautiously would seem to be the best approach.